About 20 villagers including a monarch were killed after gunmen, suspected to be Boko Haram terrorists, attacked two villages in different parts of Borno state on Tuesday night and Wednesday morning, security sources and witnesses said. In one of the attacks, the gunmen on Wednesday morning at about 7 a.m. stormed Wala Village, killing 18 villagers and injuring several others. Wala Village is in Gwoza Local Government Area, some 130 km southwest of Maiduguri, the Borno capital. 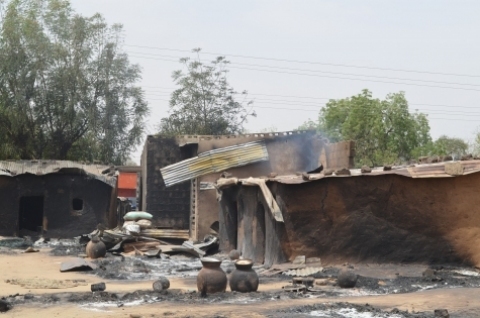 A local government official, who does not want to be named for security reasons, said “We are in difficult times in Gwoza local government; deaths and killings has become a daily affair; 18 people were killed in Wala this morning by the Boko Haram gunmen”. “We have just received the report from our officers in Gwoza that the Boko Haram gunmen had attacked Wala village and killed 18 poor souls there; it is rather unfortunate and sad development despite our efforts up here”, he said. The DSS officer also confirmed that some 12 hours earlier, another set of gunmen attacked Sabon-Kasuawa Village in Hawul Local Government Area, 210km south of Maiduguri, where they killed a local monarch (district head) and his guard. A politician from Hawul Local Government, Hyeldi Bwala, confirmed to PREMIUM TIMES on phone that the gunmen attacked the monarch shortly after he returned home from the mosque where he went to observe the Tuesday night prayers at about 7:30 p.m.
“They simply walked right into the palace of the monarch and shot him in his bedroom. And on their way out they also shot at his guard before fleeing away into the dark night”, said Mr. Bwala. Wala Village is also about 130km away from Chibok town where over 100 secondary school girls were abducted on Monday night by suspected members of the Boko Haram. The students are yet to be found. The top monarch of Gwoza, Idrissa Timta (who is addressed as Emir of Gwoza), had last week made a save our-soul plea to the Nigerian government and security agencies to come to the aid of Gwoza residents whom he said suffer too frequent attacks. “We in Gwoza have suffered too many attacks, killings and destruction, in the past weeks and months. There is no day that we don’t mourn the death of at least seven people who were being killed by the insurgents,” the monarch told journalists. “Our people have been forced to flee, our markets no longer operate optimally, food items, goods and wares are no longer coming into Gwoza for a long time now. We want action from government so that lives can be saved; if nothing is done we have no other option than to desert our homelands and flee in to the neighbouring Cameroon towns where we may perhaps get protection”. Gwoza is the one of the mountainous countryside of Borno State that shares borders with Cameroon in its south and Sambissa in its north. Gwoza’s rocky mountains have served as a hideout for Boko Haram terrorists. The Borno attacks have continued despite an emergency rule imposed on the state, as well as Adamawa and Yobe, since May last year.